I wear a CGM (continuos glucose monitor) and this is what keeps things pretty normal for me and allows me to keep my sanity with my diabetes — not too many unexpected lows or highs. Last night my equipment, aka CGM, did not perform like it is supposed to. I awoke from my deep sleep feeling a little funny. I had the sense to test my blood sugar even though I do not exactly remember feeling low. 31 mg/dL. That was the number on my screen. I couldn’t believe it so I tested again on my other hand. 32 mg/dL. I was still in confusion. If I was this low, wouldn’t my trusty Dexcom CGM have told me?? Given out a warning call to awake me from my deep sleep? I awoke my CGM by pressing a button on it’s face and it read something like 121. It was not exactly picking up the low I was experiencing. I am aware that a similiar story has been told probably dozens of times from many of the diabetes bloggers out there. Yet, I still feel my story needs to be told. I am writing this post after just waking from a 1.5 hour nap with my dog Jonah and the reality of what happened last night is sinking in. As some of you already know, I have had Type 1 Diabetes 25 years next month. Over the last few years, I have started sensing my lows less (hypoglycemic unawareness) but always seem to get lucky in that I wake up feeling kind of low and test to maybe a 65 mg/dL or 58 mg/dL and/or my CGM usually alarms me. I nudge my husband. “Juice. I need juice.” He responds back, “4 ounces?” He dutifully runs to the kitchen, pours the magic solution while I wait for him what can sometimes feel like endless minutes. I drink it and everything is fine. Why is last night’s low different? Why am I in tears right now as I share my story with you? Why do you need to hear another person with diabetes share a story of a frightful low? There are individuals that do not have diabetes reading. I am also trying to spread awareness about some of the realities of our disease. What we show publicly on the outside is often very different from what we experience privately in the dark, silent hours of the night. Last night was different because Jaim was not home. He is on a plane flying back right now from South Carolina after spending 10 days with his sister and her 3 beautiful kids. A trip I was supposed to be on too, a lovely break from the stress of nursing school, until my cat got very sick and needed my care. My legs were shaky. They would barely walk. I was aware that at anytime they might crumble below me. Every step took so much effort. My chest and heart were all sweaty and soaked through wet to my pajamas. My tongue was starting to get tingly. My heart was pounding out of my chest. I felt confused. It took all the strength in my body to make it to the kitchen, walk just a little further to grab a glass, and then back to the refrigerator to pour juice. I usually take 4 ounces, but decided this time 6 ounces might be more appropriate. I sat down at the kitchen table and started to drink my juice. I also started munching on some chocolate chips I took from the fridge. I sat and waited to feel better. I couldn’t stop thinking about my Barney Butter – how I really needed some RIGHT now. Anyone else have those intense cravings when you are low? After a few minutes, I stumbled over to the pantry and grabbed some gluten free animal crackers and a jar of crunchy Barney Butter and a knife. If there is one plus side in any of this, it is the taste of food – YUM. Food tastes so unbelievably good when you are low. 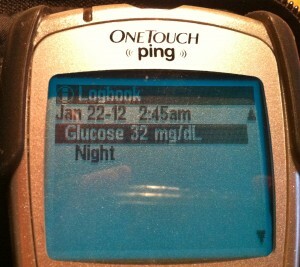 I can’t describe this to you non-diabetics either. It is almost magical tasting. I am sharing my story with you to help you understand why we so desperately need a CURE FOR DIABETES. I was able to post a picture today on Facebook of my cute dog Jonah and I on the chair in my office — no one can tell by looking at me what I went through last night. We carry these burdens alone. Silently. What I am trying to share with you, especially all of you reading that do not have diabetes and think my life looks pretty on the outside is this. Jaim was gone. I happened to wake up. I was low. An average blood sugar should be in the range of 70-100 mg/dL. I was 31 mg/dL. I think back now to what would have happened if I collapsed on the way to the kitchen trying to get my orange juice. No one was here. No one would have known. Thank you guardian angel for waking me up before it was too late. Thank you for giving me the sense to test my blood sugar instead of falling right back asleep. Thank you for giving me the strength to walk to the kitchen and poor some juice — allowing my blood sugar to recover. I have one simple request. When I come asking for donations for my 2nd American Diabetes Association (ADA) Tour de Cure bike ride in a few weeks, do not say to me, “What, you are collecting for diabetes again?” And then just ignore my plea. I am sharing my story for every man, woman and child that live with this disease and every mom and dad that parent a child with diabetes. Insulin is not a cure. Please, help us find a cure. Help us not feel so alone with this disease. Help us to know that someday we really do not have to wonder if we or our child with diabetes will wake up in the morning. There are plenty of ways to help find a cure that do not involve making a financial donation. Countless volunteers are needed. Just ask me how or check the ADA or JDRF websites to get involved. If you live in Minnesota and want to help out, we are looking for volunteers for the Tour de Cure on June 2, 2012. I can lead you to the right people, just ask. The JDRF published last year that 1 in 20 with diabetes will die of a low blood sugar. Please do not let this happen to me or anyone else. I do have some things I’d like to accomplish and stick around a little bit longer for. I am not ready to give up my life at age 36. Special note to those living with hypoglycemic unawareness and not wearing a sensor: Please take action and get a DAD (diabetic alert dog) or CGM. 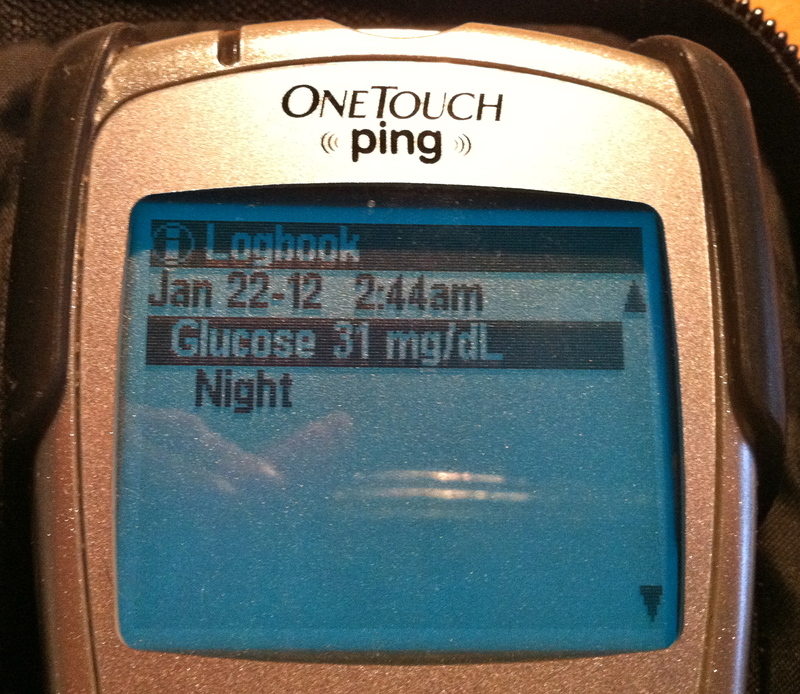 Although my continuous glucose monitor almost let me slip through the cracks last night, there have been many other times – most other times – that it wakes me with complete accuracy before it’s too late. Today my brain feels different. A little fuzzy. I am tired. And it’s just one of those days that you realize how hard this thing we call diabetes is to live with everyday. We go through the monotony of the daily grind every day. But events like this can really wake you up and help you remember why we volunteer our time and efforts looking for a cure and why we keep on fighting. Thank you to all of our friends and family who are so generous with your donations to help us find a cure for diabetes. I appreciate it so very much. Note: There is not always a reason or a cause for the low blood sugars we experience. I did nothing ‘wrong’ to cause the low blood sugar I experienced last night. I linked it earlier, but here is a great article on Hypoglycemic Unawareness including causes and ways to try and reverse it. Thank you for raising awareness, I love the fact that you directed some of this to non diabetics, some may think of our disease as sorta harmless, because we are usually able to participate in normal everyday activities. They don’t see the 3am lows when we walk into walls on our way to the kitchen to devour something fast acting. I’m slso very happy to see you mention DAD’s. I’ve had mine for a year now, and couldn’t imagine life without her at this point. Jonah looks like she would make a fine DAD. Be safe, and keep up the good work. Jim, Thank you so much for reading my post and leaving this thoughtful comment. It was the first comment that came in on the post — and it instantly relieved some of my fears of publishing such raw emotion about what I had experienced. I’m sooo happy to hear you have a DAD and it is going so well for you. I was at a JDRF meeting in the last year and a local woman that trains DAD’s spoke to us. 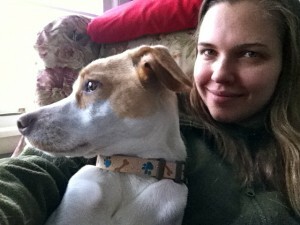 I considered training Jonah but he is such a people lover and vice versa that I think I’ll leave him a regular pooch! Part of my goal for Diabetes Light is education, awareness and advocacy – thanks for noticing! Take care. How scary Cynthia! I’m SO glad you are okay! This is REALLY well written. This would be perfect to pass onto my closest family members that may not understand the seriousness of this disease. The way you described your low was crazy accurate. The deliciousness of food, the wobbly legs, the inability to really ‘think’, the intense craving you can’t explain to those who don’t know the feeling. It’s truly like entering ‘crazy world’ and it always feels like it lasts too long. I love how you described that it makes you feel crappy the next day too. We are so blessed to have husbands who don’t travel too often. It’s not the number of lows a person gets in the night that determine whether it is dangerous because it can take just one to lead to danger. We need a CURE!! I am SO so glad that you are okay, and that you get to reconnect with your husband soon, he’s such an amazing T3! Thanks for again for sharing such an amazing story. Cynthia, That was just so scary to read about! I know that feeling all too well. I want to get a CGM too, since my low symptoms often don’t show up until my BG is almost 70 or under. Worse too,when you’re alone like that. I may wake up low, with nothing to treat it near my bed, and don’t want to wake up my Wife. She is a light sleeper,and has a hard time falling back to sleep. Juice works best for me too, usually about 6 oz. I’m glad you were ok, and hopefully this won’t happen too much . I had a similar low, and ended up over treating it the other night . You’re right, that craving got the best of me too! Big fan on this site, numerous your articles or blog posts have really helped me out. Awaiting up-dates! Wow Cynthia,I can’t imagine what you go through although I am a type 2. I read your bio and you have alot on your plate.